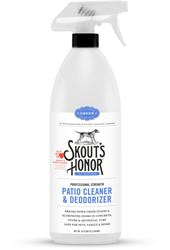 Skout’s Honor today announced the addition of two new products to its line of better, faster and stronger solutions to everyday pet messes and odors – a Patio Cleaner & Deodorizer and a Cat Urine & Odor Destroyer. The new products will make their official debut this week at the American Pet Products Association (APPA) Global Pet Expo (Orlando, Florida, March 16-18, 2016), in the Skout’s Honor Booth #2487. A powerful cleaner and deodorizer optimized for use on unsealed concrete, outdoor stone and artificial turf. Skout’s Honor products leverage BioKore™ technology and/or a rapidly biodegradable molecular deodorizer to provide pet owners with better, faster, and stronger environmentally and socially conscious cleaning solutions. The Skout’s Honor family of products is available at retailers across the United States and Canada, and also on Amazon.com. For specific retail locations, please visit the store locator. Visit Skout’s Honor in Booth #2487 at Global Pet Expo and find out what all the buzz is about. For distribution and sales opportunities, please contact Shannan Morlas, National Sales Manager, at shannan(at)skoutshonor.com.